■ Making Room For The Maker Movement: Whether through looking at the program, strolling through the vendor area, creating in the Makers Playground, or attending an EdtekTalk, it was evident this new movement is making its way into the classroom. Educators were engaged with numerous techniques to bring STEM, design thinking, and innovation back to their students. 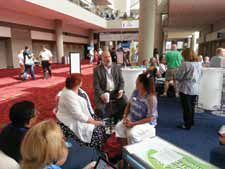 ■ Networking, Sharing, and Collaborating With Record Numbers of Educators: Excitement and enthusiasm were everywhere as educators showed up in Atlanta in record numbers. More than 16,000 registrants enjoyed the conference and even more educators joined the conference virtually through ISTE Live. More than 496,000 tweets were tweeted with the #ISTE hashtag. ■ Playing in the Makers Playground: Anyone wanting to find some fun in the Makers Playground was certainly not disappointed. The wide range of activities in the Makers Playground included Digital Age Library, Digital Story Telling, Math and Science: STEM, Creativity, Digital Age Teaching and Learning, Mobile Learning, Edtech Coaching, Google, Communication, Virtual Environments, Interactive Video Conference, and Makers and Agile Learning Environment. There certainly was not a shortage of places to play! ■ Joining New Professional Learning Networks: Visiting the Professional Learning Network (PLN) Open House was a special treat for those wanting to expand their own networks. These new Networks (formerly the SIGS) were engaging, and invited educators to join their communities and get involved. Volunteering with a PLN is a great way to become involved with the ISTE community. ■ Exploring the Incredible Exhibit Hall: Educators enjoyed viewing some of the newest innovations, learning at some engaging vendor sessions, and having the chance to win some amazing classroom resources. One could not walk out without some incredible new ideas.